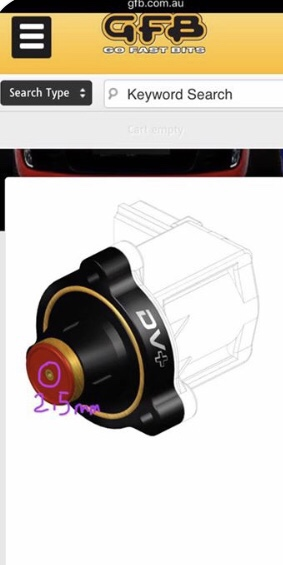 For me who hates turbo lag DV+ seems like a miracle, has anyone tested it? It's supposed to "sharper the throttle response, lightning-fast valve actuation, and the ability to hold as much boost as you can throw at it." I haven’t tried one on the RS but tried one on 3 other vag cars. My opinion is anything that reads to be too good to be true usually is. I couldn’t get on with mine, worked perfectly for a thousand miles or so but needed removed to be lubricated fairly often. One of the worst mods I’ve ever tried. I’m sure others will come along singing it’s praises though. When you first install it you definitely feel a difference to begin with. I had one on my S3 and as above have to keep lubricating the piston which got annoying so reverted back to the original. I have recently bought another one to try on the RS3 being tuned I thought it may react better and again you get the initial feel for it and it does hold boost better but again it’s a bit marmite. There is a DV+ mod you can do that a lot of tuned cars do which seems to work well and I’ll be doing soon when times available. Drill the piston hole to 2.5mm and insert a 2mm washer (any thicker and you’ll get a fault) under the spring to give it more tension between the dv+ housing and piston. I have it on mine. Not lubricated it in a year at least. Seems to work fine. Not night and day difference mind. On cold start it can be a bit funny when setting off. Just an update to this. Last week I lubricated the piston on the DV+ by spraying a PTFE type spray onto it from above. It made a significant difference to the throttle response. So it is evident that it does benefit from occasional lubrication. I have fitted the GFB DV+ to my previous PFL car and also to my current FL car. I replaced the stock item as it was a fairly flimsy thing (see pic below) and both cars had power outputs that exceed 450bhp - the threshold at which the stock valve is supposed to struggle with maintaining increased levels of boost. So does it make a difference? I would say that there is definitely a better throttle response on a mapped car (as JamesBaby has described in his post above) and at higher rpm the car feels like it pulls that bit harder. I fitted one to a friends RS3 and without any prompting or previous impressions from me he said exactly the same thing. They are fairly easy to fit for someone who is competent enough to undo some screws, connectors and rubber pipes. I have posted some pics below which may be of use to anyone thinking of trying one. This was for my PFL car but the process is the same for the FL car too. TIP: Ensure you lube the machined brass part before sliding it into its housing. I used a small dab of fresh engine oil smeared on the surface of the brass part. Remove the air intake pipe, top of the air box and air filter plus the flexi pipe connected to the DV valve (circled in red). Remove the airbox by pulling straight upwards off it's rubber mounts. Disconnect the electrical plugs attached to the valve and undo the three retaining screws. The OEM part should just slide out and be removed. The plastic parts can be removed from the front of the valve and replaced by the components in the GFB kit by following the supplied instructions and assembly drawing. Note: Lube the brass part with some clean engine oil before assembling it into the main body. These parts will now be under spring pressure so be careful they do not shoot out when attempting to refit the valve to the engine. The GFB DV+ fitted to the engine. You can see the brass body and orange coloured seal through the open aperture in the throttle body casting. Refitting all the other parts is a simple reverse of the removal process.